The following is a guest post by Sabrina Fenster. Sabrina is the Marketing Manager for The Shelf, an influencer marketing platform that enables brands and agencies to connect with the most relevant influencers. They currently serve businesses in the fashion, beauty, lifestyle, travel, food and family space. She's also the co-creator of street style blog, StreetScoutMe. You can connect with her on LinkedIn. Reaching customers in the online world is challenging; naturally, many businesses are vying for the attention of the same target market. Amid the clutter, consumers have no choice but to define trusted information sources and ignore the rest. With this in mind, there’s only one way to cut through the noise: you need to go straight to the influencers that have already won the ear of your hyper-targeted audience. While influencer marketing has been around for ages, the digital world makes it an entirely new endeavor. And, since so many businesses are looking for unique ways to reach and connect with new prospects, marketing through trusted sources seems like a natural choice. The only challenge is that influencer marketing isn’t as straightforward as most commonly used marketing methods (think Google ads, boosted Facebook posts, retargeting, traditional advertisements). Influencer marketing is made up of thousands upon thousands of bloggers who play by their own rules. While there really isn’t any way to automate influencer marketing, there are strategies you can adopt to streamline your process and run smarter, more strategic campaigns. 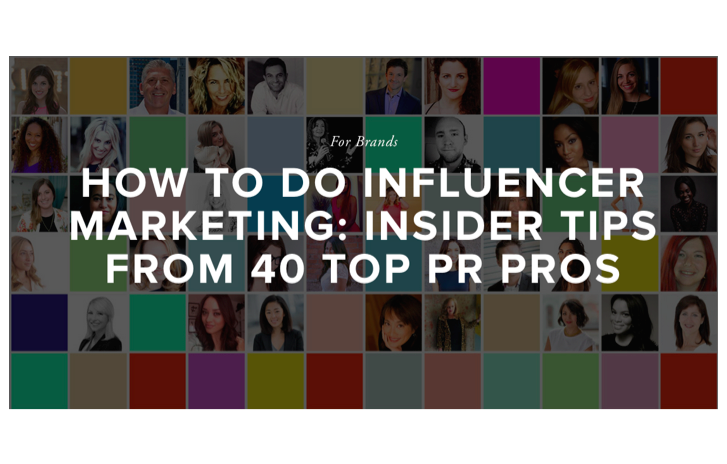 In lieu of all the confusion, we asked 40 PR experts to weigh in on how to run successful influencer marketing campaigns, and offer their best tips for brands to get influencer programs up and running. The insights range from using influencer platforms, social media advice to finding the right bloggers and more. Check out the Slideshare below for expert advice on how to run effective influencer marketing campaigns from start to finish! Would you add anything to this list? Let’s discuss in the comments!